It’s no secret that I don’t very much like this whole private cloud or internal cloud concept (see here and here), on the basis that while advanced virtualisation technologies are valuable to businesses they are a severe short sell of what cloud computing is ultimately capable of. The electricity grid took over from the on-site generators very quickly and I expect cloud computing to do the same with respect to private servers, racks and datacenters. Provided that is the concept is not co-opted by threatened vendors pushing solutions that they claim are “just like cloud computing, only better”. The potential for cheap, commoditised computing resources far outweighs the benefits of in-house installations which carry few of the benefits that makes cloud computing so interesting (e.g. no capex, minimal support, access anywhere anytime, no peak load engineering, shared costs, etc.). If you look at the overwhelming amount of coverage of cloud computing in the traditional sense versus the recent sporadic appearances of articles about private/internal clouds then the latter is what us Wikipedians call a fringe theory, and I’ve just treated it as such in the article (see below). Interesting thing is this editor who appeared on the scene at the cloud computing article recently… Initially they sought to water down the references to open source software (which currently powers the overwhelming majority of cloud computing installations, e.g. Google, Salesforce and Amazon) but then they moved on to declaring that the very definition of cloud computing should be changed to accommodate private clouds (which is not going to happen so long as the overwhelming majority of reliable sources equate “cloud” to “Internet”). The conflict of interest alarm bells were ringing already but it wasn’t until they pressed on with this change despite the absense of a consensus and protests from other editors that they were pushed to disclose affiliations. It was the redefining of “network computing” (an Oracle-ism and trademark from over a decade ago) to be a synonym for “cloud computing” using questionable sources that gave the game away and it wasn’t long before the editor revealed their identity as a Senior Software Architect at Oracle in the bay area. That in itself isn’t a huge problem, after all conflict of interest is a behavioural guideline rather than a policy, but it is when there are associated policy violations like verifiability and neutral point of view as there were here. I’m still not sure what to make of Oracle’s new-found interest in cloud computing, especially after CEO Larry Ellison heavily criticised it in a speech last year, and it troubles me somewhat that these shenanigans are going on during business hours (I’d hate to think that they were assigned the task of “fixing” the article), but for now I’m assuming good faith and waiting to see what this editor comes up with next. Anyway the result is that they’ve got their mention of private cloud/internal cloud, only it probably wasn’t exactly what they had in mind (that’s the law of unintended consequences for you). I’m sure this will be quite controversial with “I can’t believe it’s not cloud” vendors and their cronies but it’s supported by reliable sources and I believe an accurate representation of the consensus view. The term “private cloud”, so far as I am concerned, borders on deceptive advertising as it fails to deliver on the potential of cloud computing and those who attempt to use it to hang on the coat-tails of cloud computing should expect resistance. 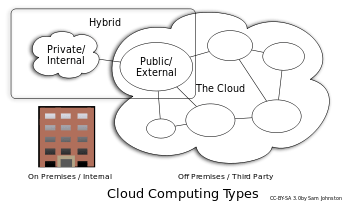 All is not lost though, as most of what people are calling “private clouds” have some “public cloud” aspect (even if just the future possibility to migrate) and can be classed as a “hybrid cloud” architecture. Indeed according to the likes of HP, Citrix and Nicholas Carr (and myself) most large enterprises will be looking to run a hybrid architecture for upto 5-10 years (though many early adopters have already taken the plunge). Yes it’s semantic but the important difference is that you’re not claiming to be a drop in replacement for cloud computing, rather a component of it. You can expect a lot less resistance from cloud computing partisans as a result. As usual the diagram is available under a Creative Commons Attribution ShareAlike 3.0 license in PNG and SVG formats from the Wikimedia Commons (Cloud computing types.svg) so free to use it in your own documents, presentations, etc. Private cloud and internal cloud are neologisms that some vendors have recently used to describe offerings that emulate cloud computing on private networks. These (typically virtualisation automation) products claim to “deliver some benefits of cloud computing without the pitfalls”, capitalising on data security, corporate governance, and reliability concerns. They have been criticised on the basis that users “still have to buy, build, and manage them” and as such do not benefit from lower up-front capital costs and less hands-on management, essentially “[lacking] the economic model that makes cloud computing such an intriguing concept”. While an analyst predicted in 2008 that private cloud networks would be the future of corporate IT, there is some contention as to whether they are a reality even within the same firm. Analysts also claim that within five years a “huge percentage” of small and medium enterprises will get most of their computing resources from external cloud computing providers as they “will not have economies of scale to make it worth staying in the IT business” or be able to afford private clouds. The term has also been used in the logical rather than physical sense, for example in reference to platform as a service offerings. Update: This article was featured on CircleID on 6 March 2009.